“Kuttram Purindhavan Vaazhkaiyil” from the film Rathha Kaneer is one of Tamil cinema’s immortal songs. Sung by C.S.Jayaraman, the song is unforgettable for its portrayal of the protagonist’s sufferings brought about by his own misdeeds. The lyricist was Ku.Sa.Krishnamurthy, the man who authored one of Tamil stage’s biggest hits, Andhaman Kaidhi. Kumbakonam Swaminatha Pillai Krishnamurthy was born on 19th of May 1914 to Swaminatha Pillai and Meenakshi Ammal. Bitten by the acting bug at an early age, he dropped out of school when he was eight years of age and joined a Boys Company (presumably the Madurai Original Boys Company), where he learnt the craft under the legendary M.Kandaswamy Mudaliar. He soon became a regular feature on the stage circuit, even travelling to places such as Singapore, Malaysia and Burma to act with the likes of K.B.Sundarambal, S.G.Kittappa and S.S.Viswanatha Dass. 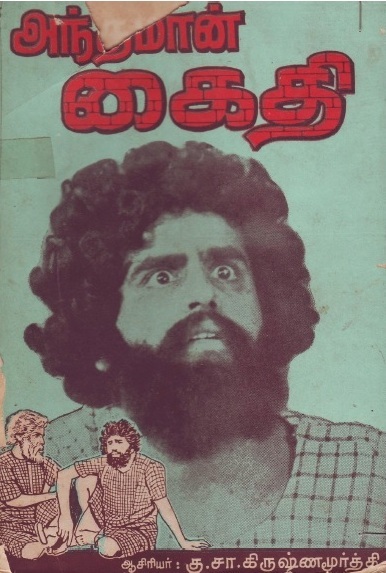 After a hiatus from acting during which he ran a publishing house in Pudukkottai, Krishnamurthy wrote “Andhaman Kaidhi” in 1938, the play which later gave him the big break in his cinema career. Though he staged it a few times with the help of his friends, it was his wish that it be staged by the T.K.S.Nataka Sabha. In 1945, he met T.K.Shanmugam during a show of Avvaiyar and gave him the drama book, requesting that it be staged by him. Shanmugam read through it fully and found it to his liking. In his memoirs “Enadhu Nadaga Vaazhkai”, he says that what he found most remarkable about the script was that it was ready for staging without almost any correction, something that he had earlier seen only with the plays of Pammal Sambandha Mudaliar. S.S.Rajendran donned the role of the hero of the play, with other T.K.S Nataka Sabha regulars such as T.K.Bhagavathy and M.S.Draupadi playing other important roles. T.K.Shanmugam took a break from acting and restricted himself to directing the play. The songs were written afresh by Krishnamurthy. Bharatidasan’s “Thunbam naergayil” and Subramania Bharatiyar’s “Senthamizh Naadenum” too were used at appropriate places. The play which was inaugurated on 20th September 1945, met with resounding success. It won critical acclaim by personalities from the literary world such as Va.Ra, Anna, Namakkal Kavignar and Bharatidasan for its reformist theme. The play went global too, being staged in Singapore, Malaysia, Srilanka and even South Africa. Thanks to the success of the stage play, it was not long before it was remade into a movie. M.G.R played the lead role in the movie, which was released in 1952. It was produced by Radhakrishna Films of Alleppey and was directed by V.Krishnan, a cameraman associated with Pakshiraja Studios of Coimbatore. Writing about the movie in his column “Blast from the past”, Randor Guy says that it was initially directed by K.Subrahmanyam, who walked out midway due to some reason. Krishnamurthy wrote the screenplay for the script, which was tweaked to make it suitable for cinema. With popular stage actors such as T.N.Sivathanu and M.R.Swaminathan lending support,the movie was well received. Krishnamurthy went on to work as a lyricist in many movies. Apart from”Kuttram Purindhavan Vaazhkaiyil”, his other famous songs included “Ennam ellaam inba kadhai pesudhe” in Chakravarthy Thirumagal and “Nilavodu Vaan mugil aadudhe” in Raaja Rajan. He wrote over 750 songs in his film career. Andhaman Kaidhi won him the award for best writer from the Tamil Nadu Sangeeta Nataka Academy (later known as the Iyal Isai Nataka Manram). He was awarded the “Kalaimamani” award in 1966 for his contribution to Tamil literature. His works, which were later nationalized by the Tamil Nadu Government are available online in the Tamil Virtual University website. He passed away in May 1990, a week before his 77th birthday. His birth centenary was celebrated earlier this year.